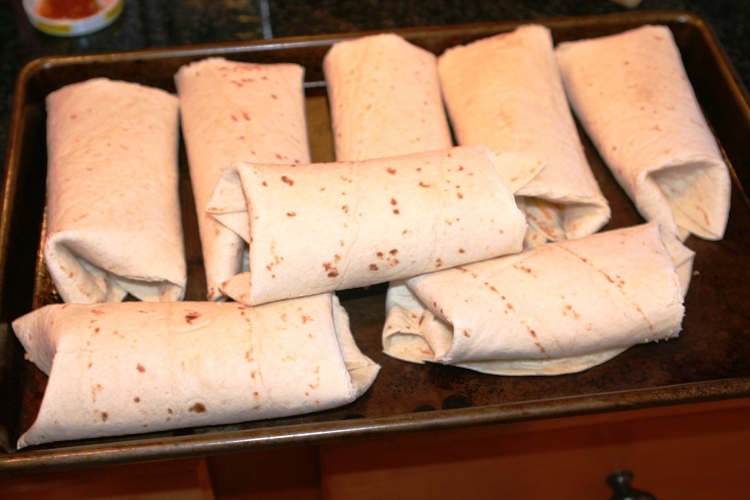 Heat tortillas in a wet towel on 15-20 second increments until soft enough to fold without breaking. 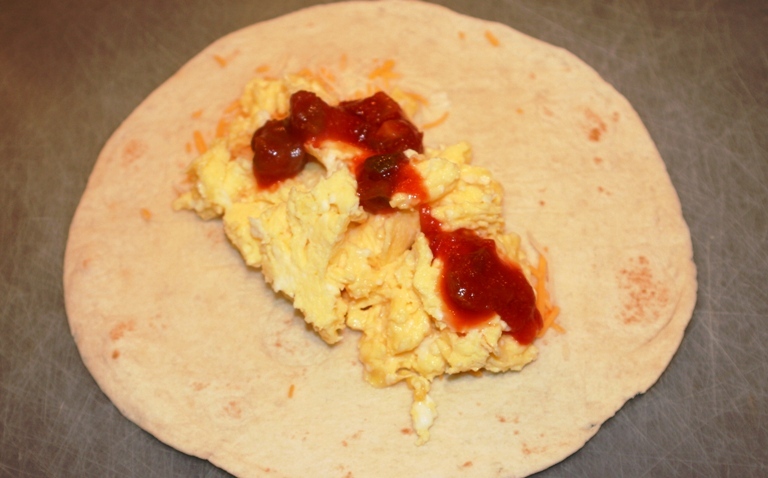 Layer with 1-2 tablespoons shredded cheese, top with warm eggs (melts cheese), then about 2T salsa per burrito. Fold in sides and roll up. I then wrap them in plastic wrap and put into freezer bags to heat up later. Reheating: To reheat, don’t thaw(they will get soggy). Heat in microwave on high for about 1 minute. Serve with sour cream and more salsa. Reheating: To reheat, don’t thaw(they will get soggy). Heat in microwave on high for about 1minute. Serve with sour cream and more salsa. These look amazing! I have never tried to make them and freeze them in bulk. I think I will give it a whirl though, after seeing your post. These are such a great time and money saver! Quick question, I noticed that you are wrapping in plastic wrap and then placing in a freezer bag. When you microwave them, do you remove them from the bags or do you just throw them in? I do a really similar thing for lunch burritos – ground turkey, onions, brown rice, black beans and cheese. They make a great on-the-go lunch, but I wrap my in parchment paper instead of plastic and then put them in a freezer gallon bag. We reheat in the parchment paper and it works great because the paper doesn’t stick to the burrito. that’s a great idea… but how do you get it to stick together??? I’m assuming the parchment would unravel if not placed seem side down throughout the whole process… which would be difficult to do. If taping it shut then will the tape stay secure in the freezer & safe during reheating??? Or remove it before reheating??? My family LOVES these! I haven’t made them in awhile. Thanks for the reminder! I also make some with ground beef and cheese for lunch, or even pizza ones, but those can be tricky and messy if I get too generous which I fill them up. I have recently started making these. They are great to have on hand. I have modified the recipe to make lunch burritos too. Tasty, healthy and inexpensive. Do you make ahead and freeze lunch ones too? Yes! I like to do cheese, beans, spinach and other items. Freeze then cook it in the over in aluminum foil. Microwave makes it mushy and rubbery. I recently did this with beef burritos. The filling was shredded beef, rice, blackbean, cheese, and various seasonings. I thaw in the microwave and then grill on my george forman grill with a little butter…I don’t eat them, but my hubby says they are yummy! I make these only I add ground turkey sausage (or pork sausage – whichever I happen to have) and hashbrowns and onions. I brown the sausage then drain Then I add the hashbrowns and onions to the pan for them to cook. While the hashbrownis are cooking I beat the eggs and have them ready to add. Once the potatoes are done I add the sausage back in the pan and then add the eggs. 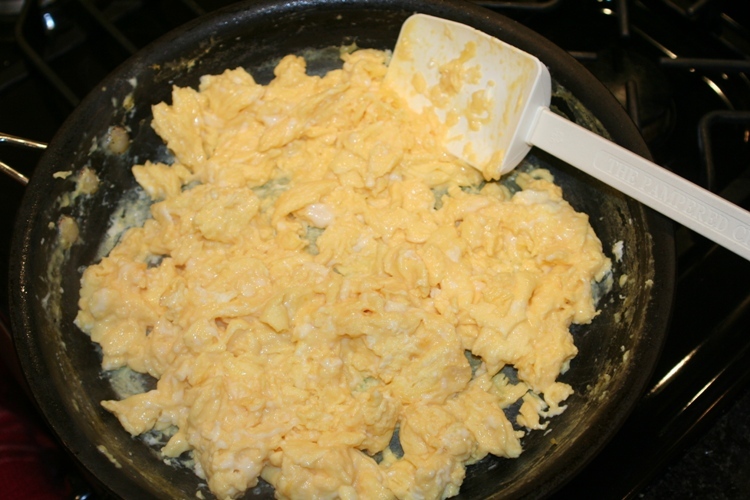 FOLD the eggs and cook until set.. Then layer eggs, cheese, and salsa (if desired – sometimes I don’t put the salsa on because my DH isn’t real crazy about salsa) on tortillas – fold in sides and roll up. Wrap in plastic wrap, put in freezer bags and freeze. When ready to eat, remove from freezer – as many as needed- remove from plastic wrap- heat individually in microwave for 45 seconds. While one is “resting” heat another. After second one heats – reheat first one for 30 seconds longer (that way IF there are any “cold spots” this takes care of it). Serve with salsa and sour cream – YUMMY!!!!! I am having issues with reheating. They are still cold in the middle I even did two minutes but anything after that and it over cooks the rest. Any suggestions? Microwaves vary, so I’m not really sure what to tell you. This is what works for me. Maybe you should try defrosting in the microwave for about 20 seconds and then cook it for 60-90 seconds. If the microwave isn’t working, then try a different method all together. Try sticking them in aluminum foil in the oven on 400 degrees for 15-20 minutes. Hope that helps! 2. Remove and heat another ONE for 45 seconds. 4. Place 2nd burrito back in microwave and heat for 30 seconds. This works well for us – something about letting them rest then heating for the final time allows the center to thaw and heat. You might give it a try and see if that works for you.